Chances are if you grew up as a Seventh-day Adventist you were never a Boy Scout or a Girl Scout. But that doesn't mean you can't tie a bowline or start a fire without matches with the best of 'em. Why? Because Seventh-day Adventists created their own organization to train children in the art of camping, marching in formation and making arts and crafts and they called... the Pathfinders. Adventists, from the very beginning, have had a very strong focus on young people. Many of the early influential Adventists were in their teens. In fact, the prophet of the church, Ellen G. White, had her first prophetic vision at the age of seventeen. There were a number of scattered instances of this desire to evangelize to the youth going back to the 1920s. Early attempts at naming these groups were a bit unfortunate though. One group based on the Boys Scouts was just called Pals. Needless to say it didn't have the gravitas of the Scouts. Another club directed by Charles Boyd was named the Takoma Indians, reminiscent of some poorly named professional sports teams. And perhaps in the most epic naming failure of all, a Lincoln Nebraska club was called Boy Pals. Again... it just just didn't have the gravitas of the Boy Scouts. The robust name that finally held the entire organization together and every Adventist today knows is the Pathfinders. This name is thought to have come from an Adventist Boy Scout leader, John McKim, who was fascinated by the story of the explorer/pathfinder John C. Fremont. When the whole organization started to gel shortly after WWII, he offered the name and it stuck. 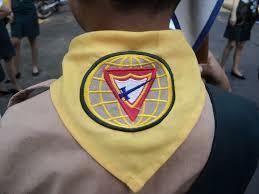 In July of 1950 the Pathfinders became an official organization. 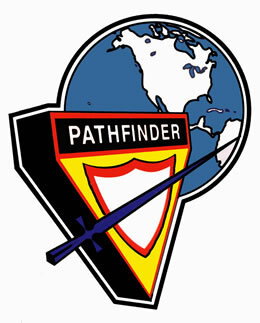 Delegates at the General Conference session formally recognized the Pathfinders as an official entity of the Church. It was described as "The Junior Missionary Volunteer Pathfinder Club, an organization that was a plan to provide activities and leadership for young people, combining physical activity with a spiritual focus. But to get a full picture of the Pathfinders we need to go back to the beginning... Hazelton, Michigan in 1879. Two young men, 14-year-old Luther Warren and his friend, 17-year-old Harry Fenner, felt compelled to figure out a way to reach out to their unconverted friends. They started a group that very quickly attracted young boys and turned into an organization with elected leaders and all the other trappings. Unaware of what Warren and Fenner had done, another young Adventist man in Antigo, Wisconsin felt the same need of guidance directed specifically toward young people. He managed to organize a similar group. This trend kept repeating all over the country for decades. Ellen G. White was also aware of the need. On December 19, 1892, she wrote, "We have an army of youth today who can do much if they are properly directed and encouraged. We want our children to believe in the truth. We want them to be blessed of God. We want them to act a part in well-organized plans for helping other youth." Yes, she used the word "army". That is just one small part of some of the misconceptions people had with regard to Pathfinders as it eventually formed. The Boy Scouts and the timing made the early Pathfinders take on the appearance of a para-military organization. One reason was that they had an amazingly impressive example. Desmond Doss was an Adventist hero from the Second World War. A conscientious objector, Doss served as a medic in the Pacific Theatre. On Okinawa, he refused to take cover in the midst of withering machine gun fire while he carried and lowered over an escarpment 75 wounded soldiers. For this and several other acts of bravery he received the Congressional Medal of Honor. Also, on a practical level, military surplus sleeping bags and tents and other accoutrements were being sold for next to nothing. This and using the Boy Scouts as a model, the early Pathfinders wore military type uniforms and spent a good deal of time practicing military-like marching drills. Growing up in the Seventh-day Adventist church I did my time in the Pathfinders. Both my parents were in the Pathfinders too, and my Grandparents (my Grandfather was a Seventh-day Adventist physician... another stereotype) were Pathfinder leaders and my aunt still is. In fact she is taking her club to a national Bible trivia challenge next month. For my mother, Pathfinders was a highlight in her childhood memories. She was fortunate to have Lawrence Paulson as her leader. Paulson founded a group in Glendale, California in the late 1940s. He was enthusiastic, without being overly so. My mom remembers him having a great cook. He taught her and her friends Native American dances and they performed them in public. But mostly, Paulson was the consummate outdoorsman. He taught them how to survive in the wild. He taught them about plants, wildlife and usable skills. To quote her, "He loved what he did and you just felt proud to be a member of his team." She was fortunate to have him in his final few years of leadership. Mr. Paulson was skilled, wise and knew what young people needed. She also said, "He definitely left a mark on me in terms of how I view and treat others." Another element of this was the adoption of the merit badge. Much like the Boy Scouts, mastering a skill was rewarded with a patch with an image reflecting the skill. For most people, I would imagine the word Pathfinder evokes the romantic stories James Fenimore Cooper wrote about the frontier he never actually saw. For Adventists, it is a whole different image. 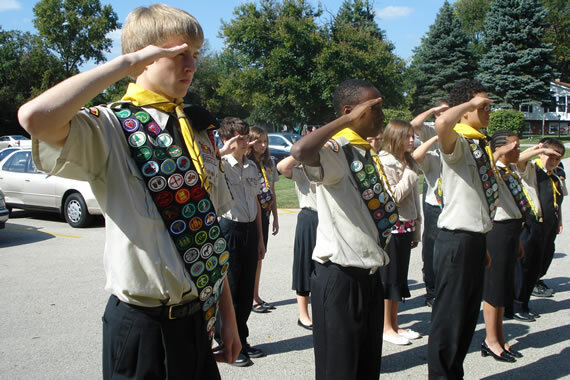 It evokes uniforms with merit badges, roasting vegetarian hot dogs (Big Franks) over a campfire and the big Oshkosh, Wisconsin Pathfinder Camporee every five years. Think of Oshkosh as the Woodstock of Pathfindering...thousands of young people converging on an open field in Wisconsin or actually maybe it can be more appropriately likened to the National Scout Jamboree the Boy Scouts hold. So as I said at the beginning, most Adventists may never know the capitalistic pleasures of selling Girl Scout cookies but that doesn't mean Adventist kids don't know how to use a compass and rock a merit badge with the best of 'em.